Danica Sue Patrick doesn’t sound like the name a race car driver would have. If you’d told her she would become a very famous one when she was a little girl in Beloit, Wisconsin playing with her Barbies she might have thought you were a bit crazy. Danica’s mother, Bev, who was a car mechanic, claimed “She was a girlie girl.” Her father T. J. was the racer in the family, but he didn’t race cars, he raced snowmobiles. Her younger sister Brooke inadvertently got her interested. The first time she tried driving a go-kart she “swerved to miss a truck in the parking lot and crashed head-on into a concrete wall.” Long after Brooke gave up go-karts for something else, Danica was still racing. Ten-year-old Danica was hooked! It wasn’t long before Danica began breaking records in the go-kart circuit. By 1993 she was competing in World Karting Association (WKA) events. There was a hint of animosity in the air because girls simply didn’t belong in the sport or so many people thought. She took her racing seriously and in 1996 alone she “competed in 49 races [and] won 39 of them!” Danica was born in 1982. If you figure out the math, you’ll realize that she was a real prodigy. In this book you’ll learn a lot about her and how seriously she takes her racing. You’ll read about her first victory in the Indy Racing League (IRL), you’ll learn why she moved to Great Britain, why Bobby Rahal took a chance on her, how she began to rise in the ranks, you’ll learn how she physically trained for races, you’ll get a glimpse of Danica in action and you’ll learn many more interesting things about racing. This is a fascinating look at Danica Patrick, the dynamic “First Lady” of racing. 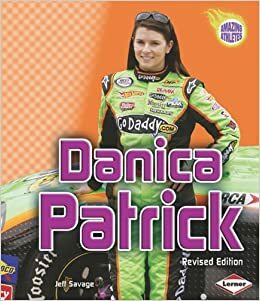 Most die hard race fans are sure to be familiar with Danica, but for those who aren’t, this book will provide a marvelous close up look at a woman who is going places in the field. If you’ve ever checked out her fabulous website, noted in this book, you’ll find that her racing goal is “to be a winner.” I enjoyed meeting her for the first time in the pages of this book and loved looking at all the full color photographs. Any words that may prove to be difficult for the young reader are highlighted in bold purple and defined in the glossary. In the back of the book is an index, some selected career highlights, and additional recommended book and website resources to explore. Quill says: If you are interested in reading about a truly amazing athlete, Danica Patrick is truly a race car driver to watch out for!